The Salinas of Torrevieja is an extraordinary place to spend a sunny morning any day of the year. You can practice photography while walking on quiet paths with your feet tucked into its pink and salty waters. Every year more and more tourists come to enjoy the waters of the salt lakes as there are people who believe them to have medicinal properties. It really is an idyllic spot where flora and fauna come together in a unique environment. The water is reddish and thick because of the amount of salt accumulated, as well as very warm. The bottom of this lagoon is a huge mass of salt, millions of pointed grains that stick to the soles of your feet, making it necessary to use footwear. Here you can admire the enormous mountains of salt that are collected when the water evaporates. 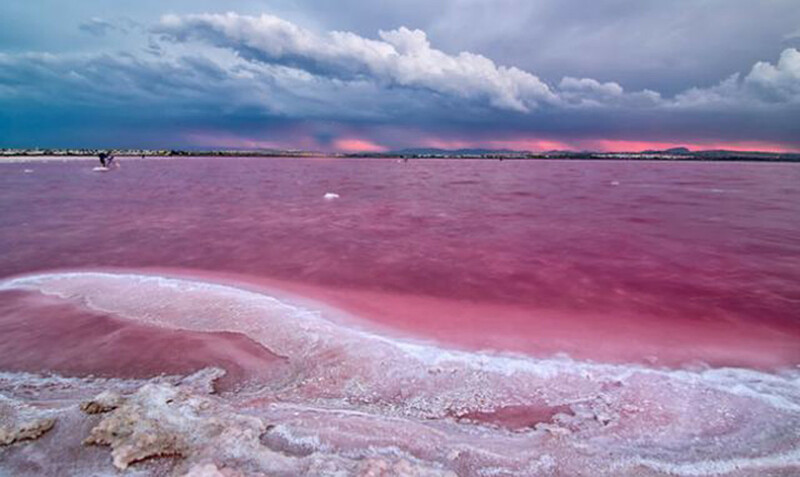 The Salinas of Torrevieja began to be exploited in the thirteenth century, and the salt is very good quality. In fact, it is exported to many different destinations in the world. In the Salinas of Torrevieja, the visual spectacle is guaranteed in the form of warm and soft tones worthy of one of the most beautiful sunsets that can be seen. This happens when the sun reaches its westernmost point. The tranquility of the place also allows for complete relaxation in one of the areas most frequently visited by tourists in Costa Blanca, Spain.